The Catvent Quilt Along top from last Christmas... Yeah. It's still just a top. Mario's quilt also really needs quilting. I still don't even have a backing for it. Definitely need to finish this by Christmas. Nothing major right now. I have 2 quilt tops I need to finish and turn into quilts. Aiming for the end of the year on those. I've also been working on making more clothes for myself, so expect to see more posts about that in the future. Really, right now I'm coming down from a month of intense, deadline-driven sewing, so I'm taking it a little easy. Just sewing what I want to sew, catching up on bee blocks, and planning for the future. So far, I am enjoying September very much! 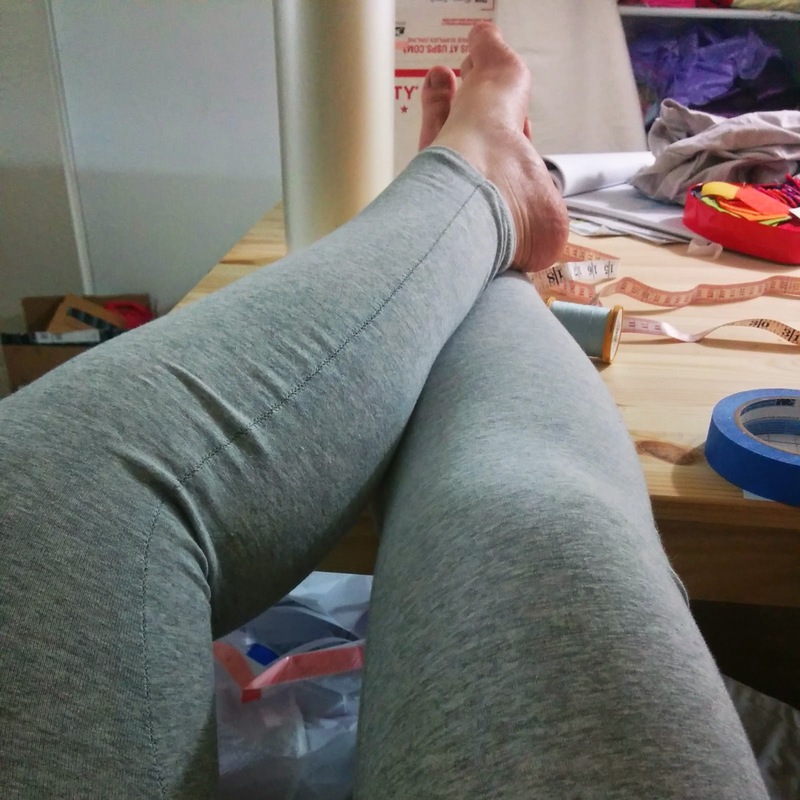 Some leggings I finished this week. Hmmm. That's a tough one. I have a tendency to do what I want and not care about things like what the pattern tells me to do or worrying about trendy color combos. I try to just make what makes me happy (or what will make the intended recipient happy!) and not worry about anything else. I don't know if that really makes what I do different, but it definitely makes me happy! I create to fill a need. I don't do well with idleness and I find I am the calmest and most satisfied with my life when I am actively working on creating something. What I create can vary widely- I love crafts of all kinds, but I also love writing. Little known fact about me- I studied English and Creative Writing in my undergrad career with an emphasis in poetry. And those poetry workshops were the best classes I took in college. I've loved writing since I was really young. I still have the first book I ever wrote, laminated and spiral bound for the Young Authors program in Washington. Lately my writing hasn't been so regular, but I'm working on that! So I guess long story short, I create because I love it, because I need to, because it's fun and fulfilling in a way that nothing else is. I think this one is even harder because it really isn't a standard thing. Sometimes I have an idea that I need to make or write RIGHT NOW or the WORLD WILL END. And I get started as soon as I possibly can, taking breaks only for my day job and sleep. But sometimes I have no idea what I want to do, so I just wander around my sewing room or doodle in my journal until I figure something out. Sometimes I work on something a little at a time, sometimes I focus on one thing to completion, sometimes I jump around from project to project. I guess my creative process is just really flexible and sometimes unpredictable. Which suits me just fine.